Are you a content writer or blogger? If yes, then you probably face the same situation several times, staring the computer screen for long & long thinking about what to write. It’s very normal. Each & every proficient or newbie writer some or the other day undergoes this writer’s block state of affair. A writer has to dig out how to unearth new ideas about giving his or her readers fresh & new articles, so that they do not lose their interest in his or her blog. A long list of ideas is there for writers, the list is so long that you’ll be unable to include each & every point of it. Just chase these guidelines, bookmark this blog and continue checking frequently, at-least thrice a week so that you do not fail to spot any important tip or information on what to blog about. P.S. Actually, you may feel that these tips & ideas are of no use. These tips may appear ‘common’ or ‘isolated to the subject’ but trust me, what exactly you require to acquire a lengthy list of exclusive titles for your blog. Every single tip mentioned below will work, not just for a group of people but for all and sundry – no omission. Get Ideas Mailed To Your Inbox:- A free service is offered by Google Alerts which permits you to chose a question of your preference and the sort of outcome you desire such as- Videos, blogs, books, news, etc. and you will obtain the desired results automatically in your mail account. You can modify the rate of recurrence of the e-mails and results per e-mail, according to your requirements. As you arrange an alert, the e-mails you take delivery of will serve as a source of ‘notions’ – discover some motivation from them, and initiate writing again. The More You Read, The More You Write: - You possibly will doubt how reading will facilitate you in receiving more notions to write about, but it surely will help you a lot. Reading various blogs, articles, magazines, etc, in your niche on a regular basis, magazines, articles in newspapers, etc. To trail the most admired blogs associated to your niche is the best way out. Keep on reading them frequently, make attempts to find out what is the most admired point in his writing style, get some inspiration from his writing. Learn by heart, NEVER COPY! Give yourself a try, write on your own, copy-paste is for losers. It merely destroys your imagination and it’s depletion of time. If you copy, now or ever, Google or other search engines will uncover and eradicate your website. If yet you want to copy someone else’ creativity, kindly don’t denote yourself as a “writer” or “Blogger” and please stop insulting the entire society. Be innovative, become an admired blogger! Reading Doesn’t Help? No Problem! - If reading does not assist you, or at times you may experience laziness – it occurs occasionally. Check out videos in that state of affair. Spend time in watching TV shows, surf YouTube and other video websites, or explore the ‘videos’ segment of various websites. At times even movies can help out ‘but rarely’. Post a Review: - When you don’t find anything, various goods & products are available, you can initiate writing reviews of the products, yet the success of your blog depends on what you write. If you put in writing about devices, write reviews on devices like- laptop, mobile, i-pad, etc. Write about movies? Write book reviews! All this will certainly depend on your writing style. If you have by no means written any product or book review, then here are few tips- Review of any product or movie begins with a rapid preface about the product, write about positive & negative aspects of the product, and make sure you write in simple language. Later, write about cost and accessibility of the product. A review must be full of your impartial data which can facilitate others to make out about that specific product. Please make a note that the supposed ‘layout’ may vary as per the product. Q&A Websites and Forums: - There are a number of websites where public ask their queries, and others respond to them. Few most admired websites are Wiki Answers, Yahoo Answers, AskMeFast, etc. Surf queries linked to your blog on these websites, create an inventory. Locate the subjects on high precedence, about which public place more & more queries, more habitually and rest at the last. You can obtain a large list of hot topics from these websites. Even forums are an excellent spring of finding hot topics, look into the most vigorous forums and boost your inventory of titles. Share Your Experience: - If you are posting any article about “blogging” or associated material, you just require considering about the instance when you began blogging. Absolutely you must have suffered a lot of issues in the primary days, at times you just get jammed with a fault and it consumes a day or more to find out what went wrong. Share it! Begin to write about each & every problem you suffered in your initial days of blogging, don’t overlook issues which seem small to you – write all of them. Somebody, someplace is undergoing the same phase which you have already crossed, they require your help & will surely gain something from your experience. So do not hesitate, keep on writing as well as sharing. Stumble through Haphazard Articles: - Bump into is a great resource, just select the group you are fascinated in and initiate stumbling. 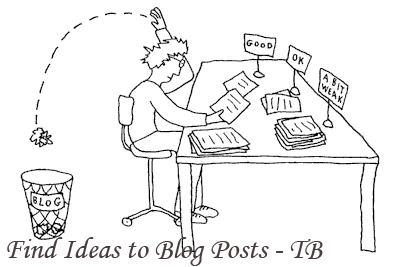 You will locate large number of topics and notions to blog about. You can also put forward your articles on StumbleUpon, somebody will surely get stimulated with your opinions, so always be hopefully. 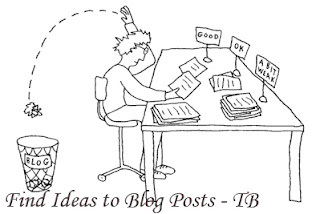 Conserve Your Ideas: - Definitely you must be having lots of thoughts about fresh titles for your upcoming posts, make sure not to share them, save them! Don’t suppose that you will memorize them or you will explore for them the later you require some new ideas for an article– It will kill your competence. Generate an account on Google Docs or write all your ideas on a word doc at your computer create an inventory and save it. It is recommend dedicating & working seriously the whole day on this work only, “getting ideas”. Believe me; you will have a large list of titles at the end of the day. This list will have enough titles to work for few days, plus it will accumulate your time as well. Anytime you wish to write something, just open the list, opt the title and initiate writing. These are few of the methods I bring into play to unearth ideas to write about (blog posts); I expect you too will gain a bit from it.